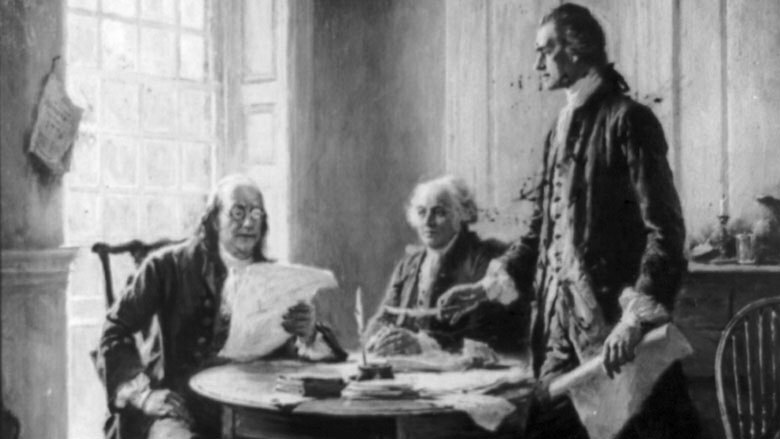 From left, Benjamin Franklin, John Adams, and Thomas Jefferson (Wikimedia). Exactly 233 years ago today, on March 28, 1786, two of America’s founding fathers documented their first exposure to Islamic jihad in a letter to Congress; like many Americans today, they too were shocked at what they learned. We took the liberty to make some inquiries concerning the grounds of their [Barbary’s] pretentions to make war upon nations who had done them no injury, and observed that we considered all mankind as our friends who had done us no wrong, nor had given us any provocation. The ambassador answered us that it was founded on the laws of their Prophet, that it was written in their Koran, that all nations who should not have acknowledged their authority were sinners, that it was their right and duty to make war upon them wherever they could be found, and to make slaves of all they could take as prisoners, and that every Musselman who should be slain in battle was sure to go to Paradise [dated March 28, 1786]. One can only imagine what the American ambassadors—who years earlier had asserted that all men were “endowed by their Creator with certain inalienable rights”—thought of their Muslim counterpart’s answer. Suffice to say, because the ransom demanded was over fifteen times greater than what Congress had approved, little came of the meeting. It should be noted that centuries before setting their sights on American vessels, the Barbary States of Muslim North Africa—specifically Tripoli, Algiers, Tunis—had been thriving on the slave trade of Christians abducted from virtually every corner of coastal Europe—going as far as Britain, Ireland, Denmark, and Iceland. These raids were so successful that, “between 1530 and 1780 there were almost certainly a million and quite possibly as many as a million and a quarter white, European Christians enslaved by the Muslims of the Barbary Coast,” to quote American historian, Robert Davis. As such, when Captain O’Brien of the Dauphin wrote to Jefferson saying that “our sufferings are beyond our expression or your conception,” he was clearly not exaggerating. After Barbary’s ability to abduct coastal Europeans had waned in the mid-eighteenth century, its energy was spent on raiding infidel merchant vessels. Instead of responding by collectively confronting and neutralizing Barbary, European powers, always busy quarrelling among themselves, opted to buy peace through tribute (or, according to Muslim rational, jizya). Fresh meat appeared on the horizon once the newly-born United States broke free of Great Britain (and was therefore no longer protected by the latter’s jizya payments). But the majority of Congress agreed with John Adams: “We ought not to fight them at all unless we determine to fight them forever.” Considering the perpetual, existential nature of Islamic hostility, Adams may have been more right than he knew. Congress settled on emulating the Europeans and paying off the terrorists, though it would take years to raise the demanded ransom. When Muslim pirates from Algiers captured eleven more American merchant vessels in 1794, the Naval Act was passed and a permanent U.S. naval force established. But because the first war vessels would not be ready until 1800, American jizya payments—which took up 16 percent of the federal budget—began to be made to Algeria in 1795. In return, over 100 American sailors were released—how many died or disappeared is unclear—and the Islamic sea raids formally ceased. American payments and “gifts” over the following years caused the increasingly emboldened Muslim pirates to respond with increasingly capricious demands. One of the more ignoble instances occurred in 1800, when Captain William Bainbridge of the George Washington sailed to the pirate-leader of Algiers, with what the latter deemed insufficient tribute. Referring to the Americans as “my slaves,” Dey Mustapha ordered them to transport hundreds of black slaves to Istanbul (Constantinople). Adding insult to insult, he commanded the American crew to take down the U.S. flag and hoist the Islamic flag—one not unlike ISIS’ notorious black flag—in its place. And, no matter how rough the seas might be during the long voyage, Bainbridge was required to make sure the George Washington faced Mecca five times a day to accommodate the prayers of Muslims onboard. Denied jizya from the infidels, Tripoli proclaimed jihad on the United States on May 10, 1801. But by now, America had six war vessels, which Jefferson deployed to the Barbary Coast. For the next five years, the U.S. Navy warred with the Muslim pirates, making little headway and suffering some setbacks—the most humiliating being when the Philadelphia and its crew were captured in 1803. Desperate measures were needed: enter William Eaton. As U.S. consul to Tunis (1797–1803), he had lived among and understood the region’s Muslims well. He knew that “the more you give the more the Turks will ask for,” and despised that old sense of Islamic superiority: “It grates me mortally,” he wrote, “when I see a lazy Turk [generic for Muslim] reclining at his ease upon an embroidered sofa, with one Christian slave to hold his pipe, another to hold his coffee, and a third to fan away the flies.” Seeing that the newborn American navy was making little headway against the seasoned pirates, he devised a daring plan: to sponsor the claim of Mustafa’s brother, exiled in Alexandria; and then to march the latter’s supporters and mercenaries through five hundred miles of desert, from Alexandria onto Tripoli. Eaton eventually managed to reach and conquer Tripoli’s coastal town of Derne on April 27, 1805. Less than two months later, on June 10, a peace treaty was signed between the U.S. and Tripoli, formally ending hostilities. Thus and despite the (rather ignorant) question that became popular after 9/11, “Why do they hate us?”—a question that was clearly answered to Jefferson and Adams 233 years ago today—the United States’ first war and victory as a nation was against Muslims; and the latter had initiated hostilities on the same rationale Muslims had used to initiate hostilities against non-Muslims for the preceding 1,200 years. Note: Sources for quotes in this article can be found in the author’s recent book, Sword and Scimitar: Fourteen Centuries of War between Islam and the West; in 352 pages and with over a thousand endnotes, it copiously documents what many in academia have obfuscated: the long and bloody history between Islam and the West, in the context of their eight most landmark battles. American Thinker reviews of the book can be read here and here).